ADJUSTABLE WORKOUT INTENSITY: Easily adjust the resistance level with the tension knob, from low to high, step by step, great low impact exercise for beginners. TONING AND STRENGTHENING MUSCLES: This pedal exerciser can help you strengthen arms and legs, improving circulation, stamina and relieving tension for greater concentration. 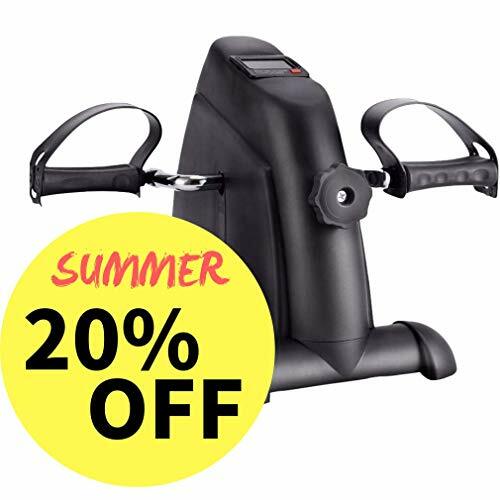 COMPACT PORTABLE DESIGN: Compact design mini exercise bike is 12.60 inch height, easily fitting under a desk or similar space, perfect for exercising in office or at home, easy to move and store, use easily when you are going to having a training. TRACK YOUR TRAINING: LCD monitor records the count, total-count, time, calories and RPM, let you fully control your exercise process. WHAT YOU GET: A SYNTEAM pedal exerciser, a manual, tools.